Perfect addition to match your Skip Hop Zoo meal time sets! 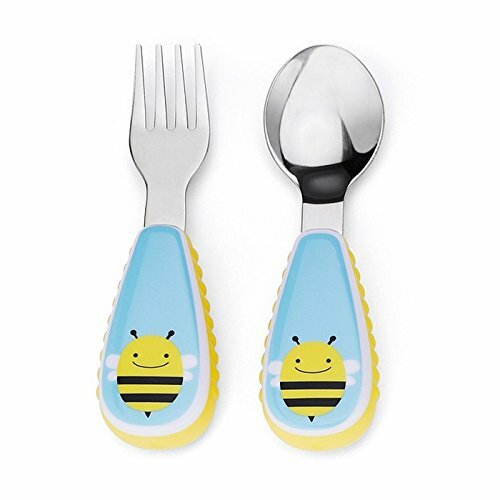 This adorable fork & spoon has soft side grips so it's easy for little ones to hold. Stainless steel heads make the utensils feel very grown up for little ones! -Features signature Zoo characters -Perfect chunky for growing toddlers -Stainless-steel heads -Soft sides for easy grips -Dishwasher-safe, BPA-free, Phthalate-free, PVC-free -Size (inches): 1.25l x 4.75h Fabric & Care For your child's safety and health: This product is not a toy. Always use this product with adult supervision. Do not microwave or boil. Always check food temperature before feeding. Before first use, clean the product. Before each use, inspect the product. Throw away at first sign of damage or weakness.